While the Wii continues to innovate with 3D motion controls, the DS has innovated in a completely different way. Utilizing the SNES button layout, a touch screen, and a microphone the DS has given developers the tools to make breakthroughs in handheld controls as well as innovations across the video games medium as a whole. For this DS Design entry, I intended on highlighting the games that represented excellent examples of the various types of control styles that have been pioneered on the DS. However, after I separated the games into categories, I found that almost every game bled over into at least one other category. So instead of trying to force the games into groupings according to what control type they best represent, I created a chart accurately portraying each game. In this way, it's clear to see that the DS is a system that yields games reflecting a variety of design styles and approaches. Before I post the chart, I'll cover each control category. 1) Analog controls. The PSP has had a problem trying to design dual analog style games around its singular, analog nub. Fortunately, the DS has a clever solution for analog control. By using the touch screen, developers can design analog controls that have the accuracy of a computer mouse and the freedom/flexibility of cursive handwriting. The Legend of Zelda Phantom Hourglass (video). Tiptoeing, walking, and running are all determined based on how far away the stylus is to Link. The camera control while on the boat are smooth, direct, and analog as well. Metroid Prime Hunters. This FPS on the DS was only possible due to the analog aiming via the touch screen. The aiming is precise and direct like a computer mouse. The same goes for Geometry Wars: Galaxies DS (video). Ninja Gaiden: Dragon Sword (video). Moving Ryu Hayabusa around is very similar to controlling Link in Phantom Hourglass. Also, some ninpo spells feature analog controls. 2) Only possible with a touch screen (for a handheld). Whether using the stylus like pen or interacting directly with the objects on the screen, some DS games are only suited for handheld touch screen controls. Even a mouse or a Wiimote wouldn't be as intuitive or accurate for such games. Kirby Canvas Curse (video). Between the indirect (paint lines) and direct (tapping/holding) methods of controlling Kirby or influencing the environment, the small touch screen is ideal. Any target is never to far away from your fingertips. With so many intricate ways to dynamically interact with the game world, the limited screen size prevents the game from becoming too cluttered. Yoshi's Touch & Go (video). Like Canvas Curse, the player can interact with the game world using a variety of different stokes and motions that aren't all centered around the player character (Yoshi). The direct "see it, interact with it" of the touch screen is essential for this game. Nintendogs (video). Dogs are mobile, small, and even portable pets that you can touch and interact with directly. The DS is a small, portable handheld system that allows players to interact with virtual dogs directly via the touch screen. Until portable holograms become mainstream, the DS will be the perfect system for virtual dogs. Brain Age/Flash Focus (video). From stamping the calendar, clicking boxes, pushing piano keys, to writing the answers to math problems, everything is controlled by the touch screen. 3) Intuitive, interactive touch experience. See it. Touch it. No matter what the game puts on the screen or the objective players face, controlling these games is as simple as touching the forms on the screen. When done correctly, the player effortlessly controls the game in a multitude of ways. Wario Ware Touched (video). In a few seconds, players must interpret the instructions and reach the goal of each micro game. Fortunately, because the micro games are so simple and intuitive, the player doesn't have to stress about how to accomplish the task. If you see an electric shaver and a bearded man, drag the shaver to the face and get to work. Professor Layton (video). Moving about the city, talking to villagers, searching for secrets, solving puzzles, arranging furniture, and assembling robotic dogs are all actions executed under your fingertips/stylus. Like old point and click adventure games, the world is yours to explore. Club House Games (video). Like in real life, if you want to play a card, just touch and move it. The game mainly keeps things neat and organized while preventing the player form making any moves that go against the rules. Advance Wars: Dual Strike/Days of Ruin: Moving units is as simple as a few taps of the screen. To attack an enemy in range, just tap the enemy. If you want some intel about a unit or an area, simply touch it. The battle field is laid out before you. You have the power to understand everything and make the decisions to achieve victory. 4) Touch screen buttons/controller (ie. in game buttons excluding menus). With a standard controller, many times, there are buttons that aren't used or buttons that serve no function based on the current game state. There's nothing we can do about these extra buttons. What's interesting about the DS is developers can create touch screen buttons. With touch screen buttons, the icon can be dimmed to indicate inactivity or the button can be removed from the screen all together. Such buttons have a lot of potential and flexibility. Draglade (video) (screenshot) /Jump Super Stars/Bleach: All of these fighters feature touch screen buttons. In Draglade, players can rearrange their special "bullet" attacks. 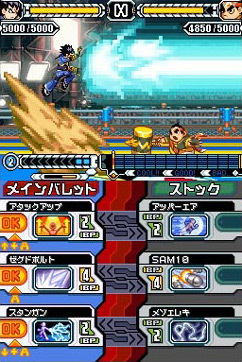 In Jump, players can use items, call in assist characters, or swtich between their main characters. In Bleach, all of the special attacks in the game that require complex button inputs (multiple directions + button presses) have simple one touch buttons on the touch screen. Ouendan/Elite Beat Agents (video). The music rythm design of these games center around timing taps, swoops, and spins on the DS touch screen. Buttons appear in time with the music and players have to tap to the beat. Rhythm Tengoku Gold (video): This game expands the range of what would otherwise be a basic "on/off" button. Tapping (and holding) creates the analogous "on" state. While holding the stylus to the screen, players can drag the stylus around thus creating an "on/scratch" state. Likewise, there are two types of "off" state. Simply letting go creates one "off" state. And flicking the stylus across the screen as you release creates a "off/flick" state. It's simple. It's intutive. And it expands the range of possibilities for the game design by a factor of 2. Ninja Gaiden: Dragon Sword. Bird calling. Phantom Hourglass: Yelling to reduce prices and to defeat a large eared enemy. 6) Improved yet optional touch screen controls. For these games, as much as the touch screen controls help, the touch design wasn't better than traditional controls across the board. Perhaps this is why both control schemes (buttons/touch) were included. 7) Drawing symbols/lines. The computer mouse and the Wiimote aren't suited for drawing or writing. Such devices work best best when pointing and clicking. But the flat touch screen with a stylus works well as a point and click device and a stable, accruate writing device. Phantom Hourglass: Drawing Boat, boomerange, and bombchu paths. Writing on the cyclone slate symbols. Writing your signiture. Canvas Curse: Drawing the paint lines in various shapes and patterns. Pac Pix: Drawing pac-mans, bombs, and walls. Brian Age: Writing letters and numbers. Ouendan/Elite Beat Agents: Tracing shapes to the beat. And I'll end with the chart. I feel I need to disagree with what you wrote about Planet Puzzle League's touch controls not being as good as the traditional button controls. I feel that the game's touch controls are a massive improvement over the button controls. Part of the problem with the game's past iterations (which have only button controls) is that it requires a lot of skill to be able to move the cursor fast enough. (To do well at the game, you have to move FAST.) The DS's touch controls have made this the ultimate game by allowing pieces to be moved at a single touch and drag, rather than having to move a cursor to the block and move it repeatedly, making it much more natural to score huge chains. I think this game makes great use of the touch controls. The game also has a button on the screen which can be pressed to raise the stack, but the L button (which, when held in the standard sideways fashion, is under the left thumb), is well suited to this job, and thanks to this, I'm not required to move my stylus away from the stack of blocks. For all the reasons you've stated above, the touch screen controls on Planet Puzzle League DS are amazing. They allow an ease of control that could not have been done before. Now people can do amazing combos with less DEXTERITY SKILL (one of the 5 measurable points of skill along with knowledge, timing, reflex, and adaptability). Here's where things get interesting. There's something pure and straightforward about manipulating a clearly quantified game (color bricks) with a digital (on/off) input method. If a square is two colored bricks to the left, two taps of the left D pad will get you there. With the digital controls, you can manipulate the game world as fast as you can push the buttons. In this way, you are never waiting on the game. The actions and the reactions are synced. On the contrary, with the analog controls of the touch screen, you can actually drag a piece so quickly, that the switching timing/animations lag behind your input. Also, because you can hold and drag bricks ahead of time in certain situations, there's a bit of a disconnect between when the brick will actually move and when you put in the input to move. For these reasons, timing the moves for combos is easier but not as 1 to 1 as with digital controls. So for these reasons, I couldn't accept the new touch screen controls as a 100% superior system.